Primary membranous nephropathy (MN) is a common glomerular disease in humans with no universally effective clinical therapy. Treatments are entirely empirical, and the disease evolves toward renal failure in a significant number of patients.1,2 The presence of glomerular subepithelial immune deposits is the distinctive pathologic feature of MN, thus supporting the concept of an immunologic origin. It is also known that inflammatory compounds such as complement, oxygen radicals,3,4 or intracellular protein kinase Cβ5 may participate, having a key role in disease progression. In the past few decades, studies of experimental models, with a particular emphasis on the Heymann nephritis (HN) model,6–8 have led to the identification of antigens of the autoantibody response in rats (megalin),7 mice (aminopeptidase A),9 and rabbits (neutral endopeptidase [NEP]),10–12 but limited data are available for humans. Moreover, megalin, which is the target antigen in HN, is absent in human glomeruli, and the LDL receptor, its human homolog, is only partially co-localized with MN IgG deposits.5,13–15 Seminal studies by Debiec et al.11,12 support the formation of immune deposits against NEP, in particular, cases with metallomembrane endopeptidase mutations that lead to NEP deficiency and alloimmunization during pregnancy. More recently, Beck et al.16 reported the presence of specific IgG4 against the M-type phospholipase A2 receptor (PLA2R) in glomerular eluates and in plasma of a significant percentage of patients with MN, suggesting PLA2R is a major antigen in this disease. Unequivocal identification of coexisting antigens in the podocyte membrane and in subepithelial deposits is essential for any progression in the understanding of the mechanisms of MN in humans. The aim of this study was to identify podocyte proteins recognized by circulating autoantibodies in patients with MN, to define their expression in glomeruli, and to quantify the levels of specific antibodies in sera and in renal biopsies. 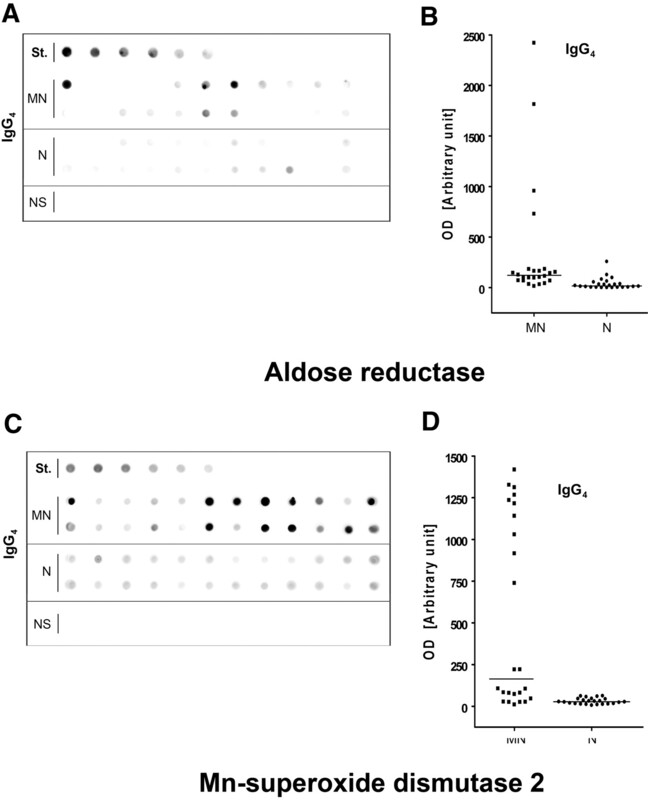 Results provide first evidence for de novo expression of specific autoantibodies against aldose reductase (AR) and superoxide dismutase 2 (SOD2) in sera and glomeruli of patients with MN. Sera from patients with MN (Table 1) were screened for presence of autoantibodies against transblotted human podocyte membrane extracts separated by two-dimensional (2D) electrophoresis. Podocyte proteins recognized by human IgG were characterized by matrix-assisted laser desorption/ionization time of flight (MALDI-TOF; Figure 1A, Table 2). As shown in Figure 1, B and C, few proteins had been repetitively recognized by MN sera: SOD2 (spots 1, 2, 3, and 4, positive in 10 cases), AR (spots 13, 14, and 15, positive in three cases), α-enolase (spots 16 and 17, positive in four cases), secernin-1 (spots 21 and 22, positive in five cases), ubiquitin hydrolase (spots 6 and 7, positive in seven cases), and ser/thr protein phosphatase 2A (spots 23 and 24, positive in seven cases). Identification of AR and SOD2 was further confirmed by Western blot (Supplemental Figure 1). Sera of MN patients show presence of antibodies against podocyte proteins. (A through C) 2D electrophoresis analysis of podocyte membrane extracts and Western blot analysis of MN serum for anti-podocyte antibodies. (A) Representative 2D map of podocyte membrane extracts stained by colloidal Coomassie. Numbers correspond to identified proteins as displayed in Table 2; spots 1, 2, 3, and 4 correspond to SOD2, and spots 13, 14, and 15 correspond to AR. (B and C) Western blot analysis of MN serum for anti-podocyte antibodies. Sera of patients with MN were largely positive for SOD2 (B and C); only a few were positive for AR (C). Representative normal sera (n = 10) run in parallel to MN samples were negative and have been reported as control. (D through I) Expression of AR and SOD2 on cultured podocytes. Nonpermeabilized human podocyte cell line stained for AR (D) or SOD2 (G) and MN sera (10% in medium) incubated with cells (E and H). (F and I) Merged images. Arrows in merged images indicate the coexpression of AR or SOD2 with MN IgG. Magnification, ×630. AR and SOD2 were localized at the cell surface in nonpermeabilized podocytes (Figure 1, D and G, and Supplemental Figure 2, A through C and E through G), where they co-localized with serum IgG obtained from patients with MN (Figure 1, F through I). Permeabilized cells showed, instead, a diffuse AR cytoplasmic staining (Supplemental Figure 2D), whereas SOD2 was limited to cell mitochondria (Supplemental Figure 2, H through M). Podocyte biotin labeling confirmed presence of SOD2 and AR on plasma membrane (Supplemental Figure 1A). Taken together, results of this set of experiments showed that MN sera contain IgG recognizing several podocyte antigens. AR and SOD2 analysis was extended to determine their serum titer, renal expression, and co-localization within glomerular structures with IgG4. After the observation in the previous section, we devised a new assay to assess the titer of circulating anti-AR and anti-SOD2 antibodies in an amplified set of 24 MN sera. The assay was based on dot-blot analysis with peroxidase detection of IgG1 to 4 linked to membrane-fixed antigens. The assay (see the Concise Methods section and supplemental material), using recombinant AR (r-AR) or SOD2 (r-SOD2) spotted as antigens, proved to be sensitive to the nanogram level. Moreover, as expected, recombinant proteins were constituted by a single band at 36 and 48 kD, respectively, and were recognized as a single band by sera of patients with MN (Supplemental Figure 3). Results shown in Figure 2 documented an increase in serum levels of both anti-AR and anti-SOD2 IgG4 in MN sera (n = 24) compared with idiopathic FSGS (n = 8) and normal sera (n = 24; nonparametric Mann-Whitney U test P < 0.001 for MN versus FSGS and P < 0.01 for MN versus normal for both antibodies). The difference was especially evident for SOD2 IgG4. It is relevant to note that no patient in FSGS group had detectable levels of circulating IgG4 autoantibodies, whereas >50% of patients with MN showed presence of specific IgG4. Dot blots with total IgG were less positive, whereas other IgG subclasses were negative (data not shown). Circulating anti-AR and anti-SOD2 antibodies are present in the sera of MN patients and completely absent in FSGS. (A and C) MN sera (n = 24, first two rows) screened for the presence of autoantibodies were positive for both anti-AR (A) and anti-SOD2 (C) IgG4. Intensity was mild or absent in normal sera (n = 24, bottom rows) and completely absent in FSGS (NS). St., calibration curve. (B and D) Corresponding dot graphs plotting OD for both anti-AR (B) and anti-SOD2 (D) IgG4. Nonparametric statistical tests (Mann-Whitney U test) showed a statistical difference between MN and normal sera (N) in all cases (P < 0.01 for anti-AR and P < 0.001 for anti-SOD IgG4; the difference between MN and FSGS was P < 0.001 in all cases). We investigated renal expression of AR and SOD2 by immunofluorescence (IF) on renal tissues from patients with MN, minimal-change disease (MCD), or IgA nephropathy or normal patients using commercially available polyclonal anti-SOD2 antibody and highly purified polyclonal anti-AR (provided by P. Kador; see supplemental material). One patient who had secondary MN with suspected neoplasia was also added to the study. AR and SOD2 were markedly and specifically expressed in glomeruli of all patients with primary MN (Figure 3, E and F), whereas both AR and SOD2 were absent in patients with MCD (Figure 3, H and I) or in normal renal tissues (Figure 3, B and C). 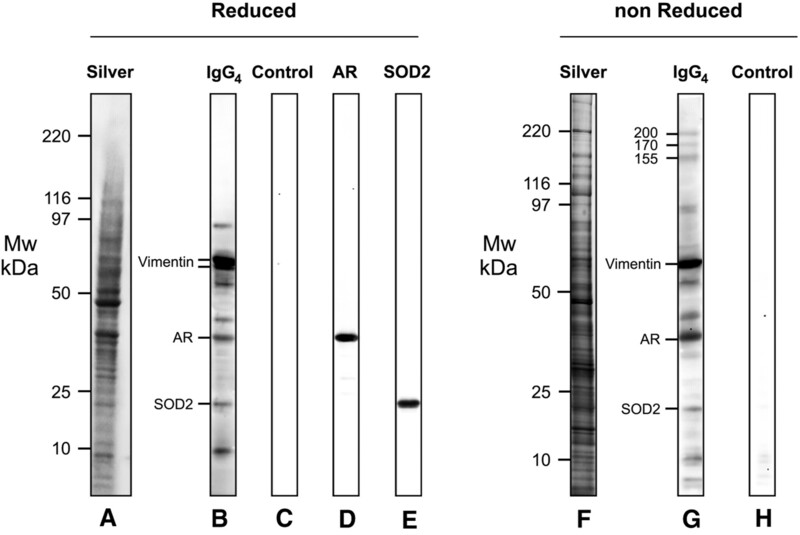 Blocking experiments with increasing amount of r-AR or r-SOD2 abolished AR and SOD2 staining, demonstrating specificity of antibodies used (Supplemental Figure 4). AR was minimally and focally expressed in patients with IgA nephropathy (data not shown) and in the patient with secondary MN (Figure 3M), whereas SOD2 was totally negative (Figure 3N). Patients with type 2 diabetes (n = 2) showed a mild mesangial expression of AR (data not shown) and no expression of SOD2. AR and SOD2 are expressed in renal biopsies of MN patients. (A through N) Representative images of renal biopsy specimens from normal patients (A through C), and patients with MN (D through F), MCD (G through I), and MN secondary to neoplasia (L through N) stained for synaptopodin (A, D, G, and L), AR (B, E, H, and M), or SOD2 (C, F, I, and N). AR and SOD2 staining is absent in tissues from normal individuals normal and from patients with MCD and only very weakly expressed in tissues from patients with MN secondary to neoplasia, whereas a marked glomerular staining for both proteins is evident in patients with MN. Synaptopodin is included to highlight glomerular structures. Bar = 200 μ. (O and P) Morphometric results of glomerular expression of AR and SOD2 in patients with MN. Bar graph shows glomerular expression of AR (■) and SOD2 (□), as measured by morphometric analysis on tissues from studied cases. Results are expressed as percentage of the positive area for each considered antibody on total glomerular area. The protein expression for both was increased in patients with MN, with high statistical significance (P < 0.001) when compared with control patients with a higher expression of AR in all considered glomeruli. Magnification, ×400. As expected, AR was not detectable at the cortical tubular level (data not shown) in the normal kidney and in patients with other renal pathologies, whereas a tubular staining for SOD2 was observed in these groups. Quantitative analysis of AR and SOD2 expression was assessed through IF morphometric evaluation (Figure 3, O and P). IEM for AR and SOD2 was performed in patients (n = 3) affected by stage 2 MN. These patients were selected among those with positivity for AR and SOD2 circulating antibodies. AR (Figure 4) and SOD2 (Figure 5) were expressed in the podocyte cytoplasm and along the podocyte plasma membrane (see Figure 4, C and D, for AR and Figure 5, C through E, for SOD2), whereas they were absent in nuclei (Figure 4E). 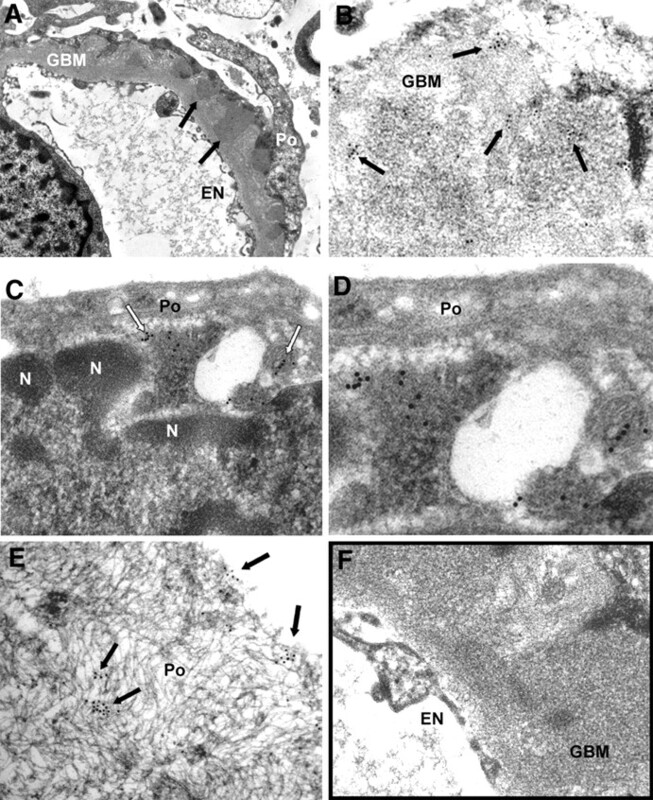 Notably, several gold particles were clearly found in glomerular basement membrane (GBM) in the context of electron-dense subepithelial immune deposits (Figure 4, A and B, for AR and Figure 5, A and B, for SOD2). Controls were obtained by omitting specific primary antibodies or using them after preincubation with nonimmune goat serum (Figures 4F and 5F, Supplement Figure 5). Overall, these results confirmed the expression of both AR and SOD2 in the cytoplasm and on plasma membrane of podocytes of patients with MN. IEM clearly indicated presence of both AR and SOD2 within subepithelial immune deposits. AR is present in GBM and in subepithelial immune deposits. (A and B) AR is present in GBM as shown by several scattered gold particles in the context of electron-dense subepithelial immune deposits (arrows). (C through E) AR was also observed in the cytoplasm and the plasma membrane of podocyte bodies (Po). (E) AR is not expressed at the nuclear (N) level; instead, AR is present in the cytoplasm as indicated by arrows. (F) Blank sample lacking primary antibody was totally negative (see also Supplemental Figure 5, A, C, and E). EN, endothelium. Magnifications: ×8900 in A; ×56,000 in B, D, and E; ×36,000 in C; ×44,000 in F.
SOD2 is present in GBM and on podocyte plasma membrane. (A and B) SOD2 was detected in electron-dense immune deposits within the GBM (arrows) as shown by several scattered gold particles. (C and D) SOD2 was also observed in the cytoplasm and on plasma membrane of podocyte bodies (Po). (F) Blank sample omitting specific primary antibody was totally negative (see also Supplemental Figure 5, B, D, and F), EN, endothelium; n, podocyte nucleus. Magnifications: ×8900 in A; ×44,000 in B and C; ×71,000 in D; ×51,000 in E; ×36,000 F.
Confocal microscopy further confirmed IEM results and specifically indicated co-localization of AR with both IgG4 (Figure 6, A through C and p1) and C5b-9 (Figure 7, A through C and p1) and SOD2 with the same IgG4 and C5b-9 (Figures 6, D through F and p2, and 7, D through F and p2) along GBM deposits. AR and SOD2 co-localize with IgG4 in glomeruli of MN patient biopsies. (A, B, D, and E) Confocal images of a renal biopsy specimen from a patient with MN. Double IF staining was evaluated for AR (A), SOD2 (D) and IgG4 (B and E). Merged images are reported in C and F and in p1 and p2. Both AR and SOD2 were co-localized with IgG4 along the capillary walls. Magnification, ×630. AR and SOD2 co-localize with C5b-9 in glomeruli of MN patient biopsies. Confocal images of a renal biopsy specimen from MN. (A, B, D, and E) Double IF staining for AR (A), SOD2 (D), and C5b-9 (B and E). Merged images are reported in C and F and in p1 and p2. Both AR and SOD2 co-localize in immune deposits. Magnification, ×630. Further experiments were done microdissecting glomeruli of three patients who had MN and were positive for circulating anti-AR and SOD antibodies (Figures 8⇓ through 10). Igs eluted from laser-captured MN glomeruli and blotted in comparable amounts (Figure 10) against whole podocyte extracts confirmed reactivity of eluted IgG4 with a panel of proteins including AR and SOD2. Podocyte proteins were separated in both reducing and nonreducing conditions. In the former case (Figure 8, a through e), microeluted IgG4 recognized eight bands in a range of molecular weight between 10 and 120 kD. The major two were characterized as vimentin and its fragments; besides AR and SOD that were recognized by mass spectrometry and Western blot (Figure 8, d and e), there were four bands with molecular weight of 90, 55, 40, and 9 kD, respectively. Overall and with the exception of vimentin, which is a cytoskeletal protein, AR and SOD2 concentration was comparable with the other components, supporting that they are major antigens in MN. As expected, more proteins were detected by electrophoresis in nonreducing conditions, and Western blot confirmed reactivity of IgG4 with most of the components already found in reducing gels (Figure 8, f through h). In fact, three proteins with an apparent molecular weight of 200, 170, and 155 kD, respectively, were recognized by IgG4, the second of which is compatible with PLA2R. Glomerular eluates from MN patients contain antibodies against podocyte antigens. Podocyte extracts were separated by electrophoresis in reducing (a through e) and nonreducing (f through h) conditions and were studied for reactivity with eluates from microdissected glomeruli. Thirty micrograms of protein was used for the analysis: Part was analyzed with silver stain (a and f), and part was incubated with glomerular eluates from patients with MN and then developed with anti-IgG4 (b and g). Eight antigens were recognized in reducing conditions and characterized by mass spectrometry as AR, SOD, and vimentin. Three more bands with a molecular weight of 200, 170, and 155 kD were detected in nonreducing conditions. (c and h) Control lines for Western blot in which glomerular eluates were omitted. (d) Western blot with anti-AR antibody. (e) Western blot with SOD2 antibodies. Glomerular eluates from MN patients contain antibodies against AR and SOD2. (A) Glomeruli showed presence of specific IgG4 antibodies against AR and SOD2. IgGs were also present at a lower titer. Controls were incubated with human serum albumin (HSA) instead of glomerular eluates. (B) Corresponding bar graph shows dot-spot OD (in arbitrary units) for anti-AR (■) and anti-SOD2 (□) specific IgG4. (C) Competition experiment using the same glomerular eluates as in A and increasing amount of r-AR and r-SOD2 from 5 to 15 ng. 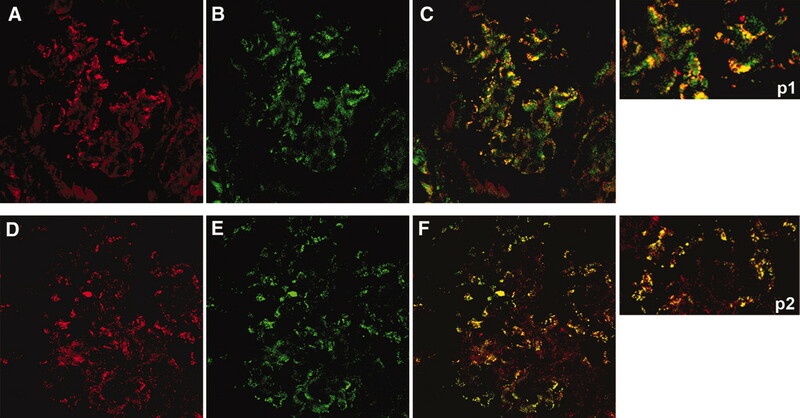 Glomerular eluates from other pathologies do not contain antibodies against AR or SOD2. Dot blot of eluates from microdissected glomeruli of a normal kidney (N) and patients (n = 7) with other glomerulonephritis implying IgG deposition in glomeruli: Systemic lupus nephritis (SLE; n = 5) and membranoproliferative glomerulonephritis (MPGN; n = 2). For comparison, two patients with MN were displayed. Anti-AR and anti-SOD IgG4 was determined as described in the Concise Methods section. Total IgG titer was determined with dot blot to nonsaturated nitrocellulose membrane, and proteins were revealed with biotinylated anti-human IgG. The same dot blot used for titration of circulating antibodies was also used for detection of specific antibodies against r-AR and r-SOD2 in glomerular eluates. Biopsies of three different patients with MN and other patients with glomerulonephritis characterized by glomerular IgG deposition (five with lupus nephritis class III or IV glomerulonephritis and two with membranoproliferative lesions) were evaluated using anti-total IgG and anti-IgG subclasses 1 through 4. Results shown in Figure 9 and 10 (for IgG4) and in Supplemental Figure 6 (for other IgGs) clearly demonstrated the presence of anti-AR and anti-SOD2 IgG4 in glomeruli of patients with MN and their absence in other renal pathologies. 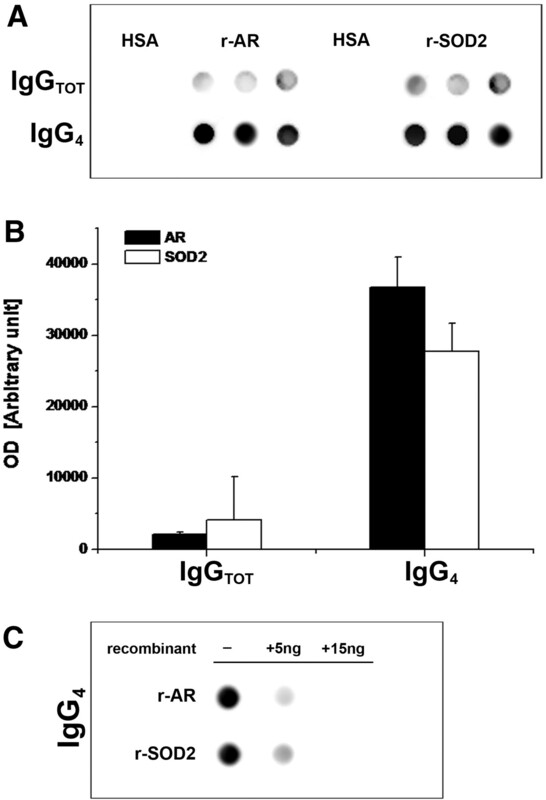 Reactivity of IgG4 was abolished by pretreating sera with increasing amounts of r-AR or r-SOD2 (5 and 15 ng), thus confirming antibody specificity (Figure 9C). As evidenced in the previous section, immortalized human podocyte cell line spontaneously expresses AR (Figure 1, D through F) and SOD2 (Figure 1, G through I) on plasma membrane (see also Supplemental Figure 1, A through C and E through G). This finding was also confirmed by biotinilization experiments (Supplemental Figure 2). Increased SOD2 expression on plasma membrane was clearly observed in vitro through Western blot (Figure 10, A and B) and IF (Figure 11C) 24 and 48 hours after 30 minutes of incubation with 100 μM hydrogen peroxide (H2O2). SOD2 was also increased in total podocyte cell lysate (Supplemental Figure 7). Increase of AR expression on plasma membrane was not evident (Figure 11C) and was only minimally appreciable in the cytoplasm (Supplemental Figure 7). In vitro oxidation modifies AR and SOD2 expression on plasma membrane. (A through C) Western blot (A), corresponding bar graph (B; ■, AR; □, SOD2) and IF staining (C) for AR or SOD2 upon H2O2 treatment. H2O2 treatment increased SOD2 expression at 24 and 48 hours, whereas AR was only slightly affected. IF on nonpermeabilized podocytes confirmed Western blot results. Magnification, ×630. Primary MN is the prototype of nephropathy associated with subepithelial immune deposits. The mechanism responsible for their formation and trapping within GBM has been extensively investigated in experimental models of HN. In this case, anti-megalin autoantibodies co-localize in glomeruli with C5b-9 and clusterin. The body of evidence for new antigens expressed in patients with MN is now growing. Debiec et al.11,12 showed that NEP emerges as antigen in patients with NEP deficiency and alloimmunization during pregnancy. More recently, Beck et al.16 showed specific IgG4 against PLA2R in glomerular eluates and in plasma of a relevant part of patients with MN. A critical point is to define whether other podocyte antigens are recognized by IgG4 eluted from microdissected glomeruli. We used Western blot with podocyte extract in both reducing and nonreducing conditions to confirm the presence a few antigens in podocytes. In the first approach, we could detect eight proteins reacting with glomerular IgG4; in nonreducing conditions, three more proteins with a higher molecular weight were recognized, one of which had the same dimension of PLA2R. Podocyte antigens recognized by electroeluted (from glomeruli) and circulating IgG4 were characterized by mass spectrometry and matched to extend studies with IEM and IF to other patients with MN. AR and SOD2 emerged as the two major podocyte components recognized by both circulating and glomerular IgG4. In particular, we found a marked increase in levels of circulating anti-AR and anti-SOD2 IgG4 in patients with MN compared with normal sera or other idiopathic nephrotic syndromes (FSGS). Moreover, de novo expression of both AR and SOD2 and co-localization with IgG4 and C5b-9 were observed in MN biopsies while being absent in other glomerular pathologies. Ultrastructural study clearly assessed localization of AR and SOD2 in podocyte cytoplasm and foot processes and in electron-dense subepithelial immune deposits. Taken together, these findings demonstrate that AR and SOD2 are neo-expressed proteins in MN glomeruli and that both are recognized by specific circulating antibodies that can also be detected in glomerular subepithelial immune deposits. 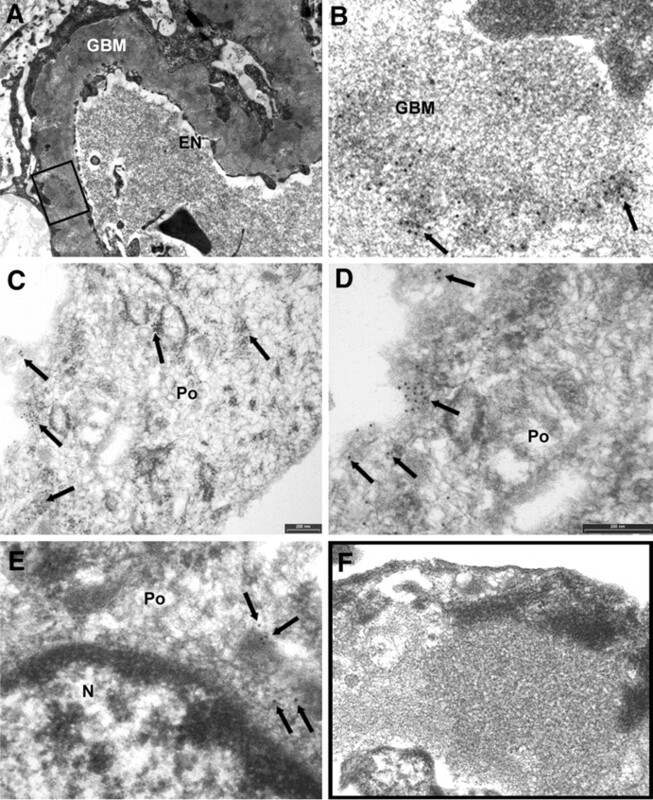 The prevalence of IgG4 in glomerular immune deposits confirms the concept of an isotype-specific deposition mechanism; therefore, AR and SOD2 should be considered glomerular antigens implicated in the immune process and actually belong, with NEP and PLA2R and with the new panel of antigens currently under investigation (G.M.G., personal observation), to the list of antigens recognized in human MN. A crucial point still remains unresolved. Our data, in fact, cannot be considered exhaustive with respect to the initial trigger event of MN in humans. Neo-expression of both AR and SOD2 may, in fact, represent a continuation mechanism after an initiation phase in which the basic event is deposition of anti-PLA2AR, anti-NEP, and/or other, unrecognized antibodies. The basic issue regarding the significance of both neo-antigens in glomeruli of patients with MN will require further investigation, although the presence of anti-AR and anti-SOD2 IgG4 in glomeruli at the time of diagnosis of MN and its absence in other autoimmune renal pathologies strongly supports a causal role in MN pathogenesis. A definitive explanation will mostly rely on animal models overexpressing AR and SOD2. Ongoing experiments for AR are experiencing problems and will demand more time to be set up because of a toxic effect of AR overexpression (data not shown). SOD2 is a crucial component of the extensive antioxidant cell protective system, transforming toxic superoxide ions into H2O2 and diatomic oxygen. In the kidney, SOD2 is widely expressed in tubular epithelial cells, especially in the cortex, where it plays a central role in preserving the kidney during ischemia reperfusion events, but it has never been reported in glomeruli. In conclusion, our data clearly show a de novo glomerular expression of AR and SOD2 in idiopathic MN nephropathy. AR was only minimally and partially observed in non-MN glomeruli, whereas SOD2 was completely absent in other renal pathologies. Confocal IF and IEM assessed presence of both AR and SOD2 in glomeruli of biopsies of patients with MN. Both antigens were present in immune electron-dense deposits and were found in close association with IgG4 and C5b-9. 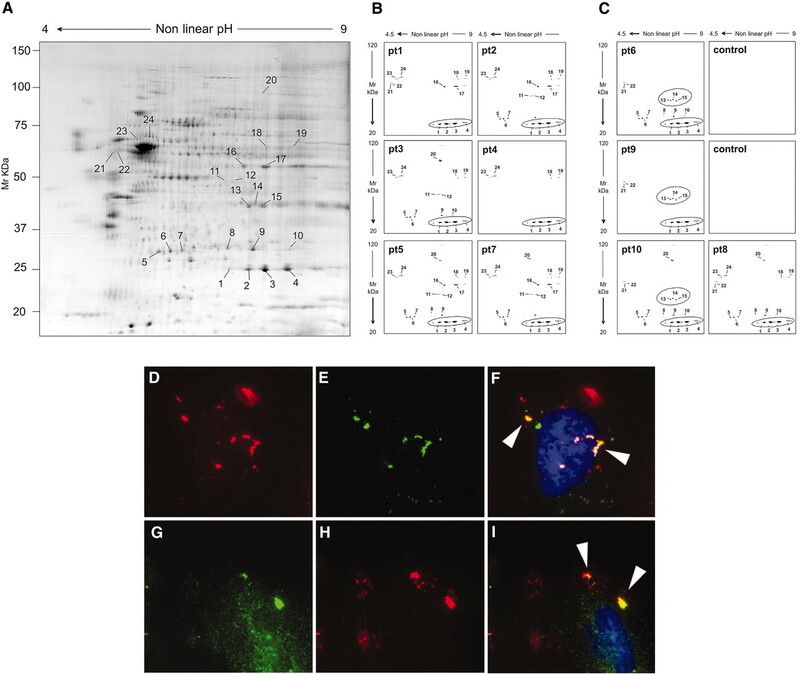 Specific anti-AR and anti-SOD2 IgG4 was eluted from isolated MN glomeruli, thus confirming both proteins as targets of the autoimmune process. High titer of circulating anti-AR and anti-SOD2 IgG4 was finally recognized in a relevant part of the same MN cohort. In vitro experiments showed that SOD2 is upregulated by H2O2, possibly implicating oxidative stress in its plasma membrane neo-expression. Regulation of AR and SOD2 within podocytes and formation of autoantibodies should play a central role in the onset and/or maintenance of MN. Twenty-four patients with MN were enrolled in the study. Seventeen underwent a complete screening for circulating autoantibodies (Western blot and dot-blot assay); sera from seven patients were used for the determination of serum titer of anti-AR and anti-SOD2 autoantibodies with dot blot. Criteria for enrollment were (1) a biopsy-based diagnosis of MN and (2) negative tests for autoantibodies (ANA, nDNA, and ANCA) and cryoglobulins and the absence of viral markers (hepatitis B surface antigen and HIV), with the exception of hepatitis C virus antibody, which was present in three patients. Furthermore, one additional patient, suspected of being affected by secondary MN because of cachexia and biliary duct obstruction, was included in the study. Although the clinical status was highly suggestive of cancer, histologic demonstration of malignant neoplasia could not be achieved. For histologic evaluation of kidney disease, Dubosq-Bresil solution-fixed tissues were embedded in paraffin, sectioned, and stained with hematoxylin/eosin, Masson trichrome, silver methenamine, and periodic acid-Schiff. Specimens for EM were fixed in Karnovsky solution and processed using standard methods. IgG, IgA, IgM, C1q, C3, and fibrinogen depositions were detected by direct IF staining on frozen sections. Blood from the cohort described was obtained the day before renal biopsy and after centrifugation at 1.55 × g for 15 minutes at 4°C, was immediately stored at −80°C. At that time, patients were not receiving any therapy. Overall, seven kidneys with other nephropathies (minimal-change nephropathy, n = 2; IgA nephropathy, n = 2; type 2 diabetes, n = 2) and noncarcinomatous portions of kidneys (n = 3) removed for renal cancer were used as negative control. 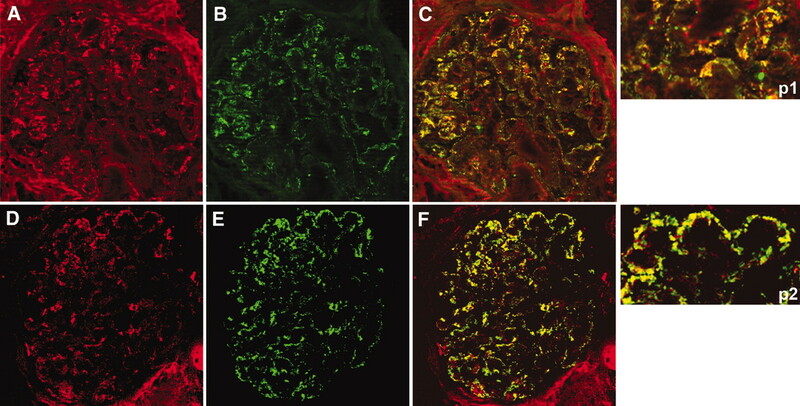 Glomeruli were microdisseted with laser capture (see the Laser Capture Microdissection and Elution of Antibodies from Renal Biopsy Tissue section) from renal tissues of patients with MN (n = 3, patients 8, 11, and 12). Normal kidney (n = 1) and renal biopsies from patients with class III or IV lupus nephritis (females, 11 to 18 years, n = 5) and with membranoproliferative nephritis (n = 2) were microdissected with the same technique. With the exception of normal kidneys, IF revealed deposition of IgG along the glomerular membrane in all other cases. Polyclonal goat antibody used for human AR protein identification was purified in the laboratory of P.K. Preparation and specificity testing of antibodies were performed as described previously27,28 and are summarized in Supplemental Methods. Purified rabbit antiserum against human SOD2 was purchased from Upstate Biotechnologies (Charlottesville, VA). Mouse mAb (clone G1D4-IgG1; Progen Biotechnik, Heidelberg, Germany) against human synaptopodin and mouse monoclonal serum anti-human C5b-9 (clone aE11-IgG2a, κ; Dako) were used in this study. Purified mouse mAb to human IgG4 (clone HP6025, IgG1-K) was purchased from Invitrogen (Camarillo, CA). Affinity-purified FITC F(ab′)2 donkey anti- human IgG, affinity-purified FITC and Texas Red–conjugated donkey anti-goat IgG, and donkey anti-rabbit IgG and FITC affinity-purified donkey anti-mouse IgG all were purchased from Jackson Immunoresearch (West Grove, PA). For IEM, donkey anti-goat or anti-rabbit IgG conjugated with 12 nm of colloidal gold particles (Jackson Immunoresearch) was used. Renal biopsy specimens were embedded in OCT (Tissue Tek, Miles, Elkhart, IN) and stored in liquid nitrogen. Samples were cut into 3-μm sections by a cryostat (Leica CM1850; Leica Mycrosystems, Heerbrog, Germany) and placed on poly-l-lysine–coated glass slides for indirect immunostaining. Cryosections were fixed in modified Carnoy solution for 10 minutes at 4°C and subsequently washed in PBS. Nonspecific binding was blocked by incubation in BSA 3% wt/vol in PBS for 20 minutes at room temperature. Sections were then incubated for 2 hours at room temperature with primary goat anti-AR or rabbit anti-SOD2 antibody diluted in PBS 1:150 or 1:50, respectively. FITC-conjugated donkey IgG anti-goat (1:50) and FITC-conjugated donkey IgG anti-rabbit (1:20) were used as secondary antibodies. Competition experiments performed with anti-AR or anti-SOD2 antibodies preincubated for 4 hours at 37°C with an excess of AR or SOD2 protein, respectively, gave negative results (Supplemental Figure 4). Negative controls were processed in parallel using an equivalent concentration of a normal goat or rabbit antiserum as primary antibody, respectively. For double-staining indirect IF and co-localization analysis, Carnoy fixed cryosections were incubated with blocking solution (3% wt/vol BSA in PBS) and in succession with FITC donkey anti-human IgG F(ab′)2 (1:20) for 2 hours at room temperature. After additional PBS washes, slides were then exposed to a diluted polyclonal goat serum anti-AR (1:150) or rabbit serum anti-SOD2 (1:50) for 2 hours at room temperature. The presence of AR and SOD2 proteins was revealed by incubation of Texas Red–conjugated donkey IgG anti-goat and anti-rabbit, respectively. IgG4 deposits were characterized using purified anti-human IgG4 mouse mAb (Invitrogen). For C5b-9 and AR or SOD2 co-localization, Carnoy fixed sections were incubated in primary step with anti–C5b-9 mAb diluted (1:10) for 2 hours at room temperature and revelated by FITC-conjugated donkey IgG anti-mouse diluted (1:20) in PBS. AR and SOD2 were detected as described already. Samples were observed using a confocal system (LSM 510 Meta scan head integrated with the Axiovert 200 M inverted microscope; Carl Zeiss, Jena, Germany) with a ×63 oil objective. Image acquisition was carried out in multitrack mode, namely through consecutive and independent optical pathways. After exposure with a blocking agent (BSA 3% wt/vol in PBS), ultrathin sections were incubated overnight with anti-AR (diluted 1:200) and anti-SOD2 (diluted 1:50) antibodies. Immune reaction was then revealed using donkey anti-goat or anti-rabbit IgG conjugated with 12 nm of colloidal gold particles. The specificity and validity of the labeling were verified by substituting primary antibody with the same antibody preincubated with nonimmune goat or rabbit serum (see Supplemental Figure 5) or alternatively be substituting primary antibody with PBS. After counterstaining with uranyl acetate and lead citrate, ultrathin sections were examined and micrographs were taken using a Philips EM208 transmission electron microscope (Philips Electron Optics, FEI, Eindhoven, Netherlands). A human conditionally immortalized podocyte cell line31 was cultured in RPMI 1640 supplemented with 10% inactivated FCS, insulin transferrin selenium, 100 U/ml penicillin, and 100 mg/ml streptomycin. Cells were expanded at 33°C. For IF, cells were plated in 6-cm Petri dishes at a density of 3.5 ° 103 cells/cm2 and differentiated for 15 days at 37°C in 5% CO2/95% air. The same cell line was used for the oxidation experiments (see the In Vitro Oxidation section). Detection of anti-podocyte antibodies in sera of patients with MN was assessed by Western blot of podocyte cell line membrane extracts separated by 2D electrophoresis (see supplemental material). Detailed technique for transblot and detection is described in the Supplement Methods section. For membrane preparation, subconfluent cells were homogenized in cold hypotonic solution containing 5 mM phosphate buffer (pH 7.4), 0.15% wt/vol n-Hexyl β-d-glucopyranoside (Calbiochem), and protease inhibitor cocktail. Homogenates were centrifuged at 14,000 rpm for 15 minutes, and supernatant containing cytoplasm proteins was discarded. Pellets were resuspended in 150 mM NaCl, 0.5% vol/vol Triton X-100, 0.25% wt/vol natrium desoxycholate, and 50 mM phosphate buffer (pH 7.4) and centrifuged at 14000 rpm for 15 minutes. Supernatants containing membrane proteins were collected, and protein concentration was determined using BCA assay. 2D electrophoresis was performed in soft gels as described previously32 (see the Supplemental Methods section). After separation in SDS-PAGE gels, proteins were visualized by a double-staining procedure: First, methyl-trichloroacetate–negative staining,33 then silver staining or Blue silver colloidal or Coomassie for preparative mass spectrometry analysis (see the Supplemental Methods section). Details of MALDI-TOF are given in the Supplemental Methods section. The titer of circulating autoantibodies (IgG4) in sera of patients with MN (n = 24), normal control subjects (n = 24), or children with idiopathic nephrotic syndrome (n = 8) was determined with dot blot using r-AR (300 ng) and r-SOD2 (300 ng) as immobilized antigens. Purity of both recombinant proteins was confirmed by monodimensional electrophoresis (Supplemental Figure 3). The technique for dot blot is described in the Supplemental Methods section. Cryostatic sections (5 μm) of kidney tissue specimens were placed on metal frame slides with thermoplastic membrane (Molecular Machines & Industries AG; Glattburg, Zurich, Switzerland), stained, and dehydrated using an Arcturus HistoGene, LCM Frozen Section Staining Kit (Arcturus Bioscience, Mountain View, CA) according to the manufacturer's instructions. Air-dried sections were then viewed with the NIKON ECLIPSE-TE 2000 inverted microscope (Nikon-Instruments, Sesto Fiorentino, Italy). Glomeruli were identified and isolated with the Molecular Machines & Industries Cellcut LMD system by focal melting of the membrane through laser activation. The Molecular Machines & Industries Cellcut Laser Capture Microdissection system is equipped with a solid-state ultraviolet laser that guarantees precise cutting without damaging the tissue. High precision xy-stage and CCD camera allow identification, documentation, and dissection of multiple regions of interest from the same tissue specimen. For each specimen, a total of 25 to 30 glomeruli were microdissected and removed sequentially in separate isolation cap (Nikon Instruments) with special adhesive material in the lid. After visual control of the completeness of dissection, captured tissue was immersed in denaturation buffer and used for proteomic analysis. Sections of human kidney derived from noncarcinomatous portions of kidneys removed for renal carcinoma were used as negative control. Igs were recovered from glomeruli by means of acid elution as described previously.34 Briefly, after washings with PBS (0.01 M, pH 7.2) groups of 20 glomeruli were incubated overnight with 0.02 M citrate buffer (pH 3.2) at 4°C in a humid atmosphere. After removal of citrate buffer, 0.4 M NaOH was added to achieve a pH of 7.2. Dot-blot analysis for anti-AR and anti-SOD2 IgG and IgG4 in glomerular eluates was performed as already described (see also the Supplemental Methods section). Total IgGs were determined by the same dot-blot assay in which 50 μl of sample had been applied to nonsaturated nitrocellulose membranes and IgGs were revealed with biotinylated anti-human IgG antibodies. For IF, human podocyte cell lines were gently washed in RPMI/2% HEPES buffer and fixed for 20 minutes at 37°C in 1% paraformaldehyde dissolved in RPMI/2% HEPES buffer. Details for cell culturing and interaction with MN serum are given in the supplemental material. Subconfluent adherent cells were rinsed three times in ice-cold PBS, and cell surfaces were labeled with the appropriate volume of 230 μM EZ-linf sulfo-NHS-LC-LC-biotin (Pierce, Rockford, IL). The reaction was performed for 5 minutes at 4°C. Cells were rinsed three times in ice-cold TBS to quench and remove the excess of biotin reagent. Membranes were prepared as described in the section Detection of Circulating Antibodies against Podocyte Proteins. Podocyte membrane extracts (200 μg) were run on a 2D electrophoresis as described in the supplemental material and transferred to a nitrocellulose membrane saturated in 3% wt/vol BSA in TBS and incubated with 50 pg/ml Neutravidin in 1% wt/vol BSA in TBS-Tween 0.15% vol/vol (TBS-T). Chemiluminescence was used for immunodetection. Images were digitalized by VersaDoc 4000 (Bio-Rad, Hercules, CA) and analyzed with QuantityOne and PDQuest software (Bio-Rad). For in vitro oxidation, human podocyte cell line was maintained in RPMI 1640 medium with 10% vol/vol FCS, 20 mM glutamine, 100 IU/ml penicillin, 100 IU/ml streptomycin, 5 μg/ml insulin, 5 μg/ml transferrin, and 5 ng/ml sodium selenite at 37°C in a 10% CO2 humidified incubator. Cells at 70 to 80% confluence were rinsed twice with serum-deprived RPMI 1640 and stimulated with 125 μM H2O2 for 0, 18, or 24 hours by addition to the growth serum-deprived media. Cells were harvested after the indicated times, rinsed three times with PBS, and lysed in 2D buffer (see the two-dimensional electrophoresis section in the Supplemental Methods). Membrane preparation was done following the same procedure described already. Nonparametric Mann-Whitney U test was used for comparison of anti-AR and anti-SOD2 IgG4 serum titer in patients with MN versus control subjects. Results were given as median. Parametric t test was used for comparing results deriving from morphometric analysis of renal AR and SOD2 expression. Results were give as means ± SEM. This work was supported by the Italian Ministry of Health, by E-RARE Project “PodoNet: EU Consortium for Clinical, Genetic and Experimental Research into Hereditary Diseases of Podocyte,” and by the Renal Child Foundation. We are grateful to Dr. M.A. Saleem for giving us human podocyte cell lines. We also acknowledge Fondazione Mara Wilma e Bianca Querci for financial support to the project “Nuove evoluzioni sulla multifattorialità della sindrome nefrosica.” We gratefully acknowledge the support of the Foundation Guido Erluison for making available the laser capture microdissection system. Data were critically discussed with Prof. Rosanna Gusmano. The manuscript was revised by Miss Capurro.